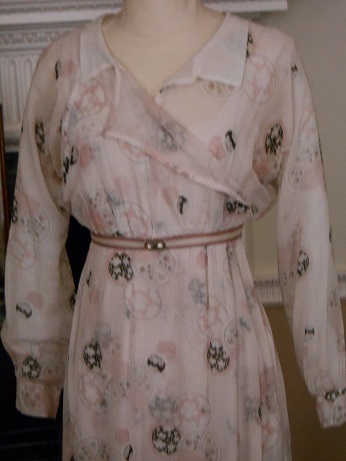 Am having a lovely weekend sewing, Jake has gone back to Uni so it is very quiet here now. I am just finishing off the last few bits for Sarah’s stall at Yarndale next week but have popped in to share with you the very exciting news that her book of designs is being published and is available for pre-order. 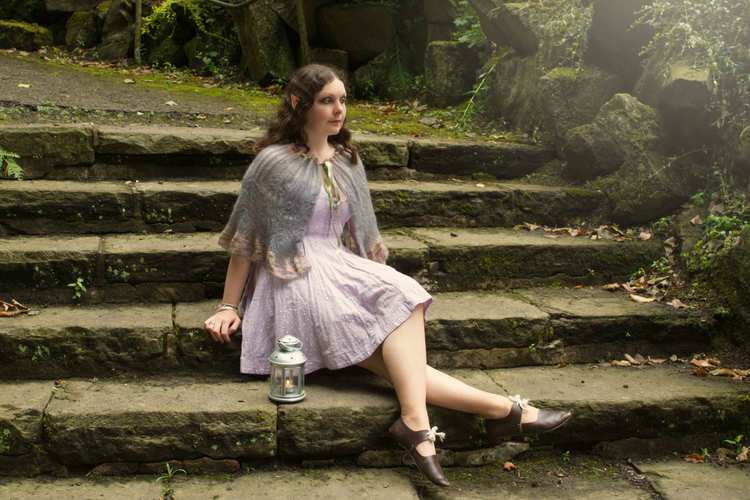 Not only does it have some stunning designs in it, Sarah is hugely talented and very creative and there are some beautiful things, it also features my lovely daughter Ellie with elf ears! She was very, very excited to be asked to model for this, (unaccustomed as she is to having her photo taken of course), and had a brilliant day with the other two models, my friends Suzi and Helen from knitting group, in a local park which has a lot of dells filled with ferns and made a brilliant setting for the designs. There is a little video showing the location and an outtake from the shoot here – the girls challenging their inner Charlie’s Angels! Unfortunately the elf ears had to be added post -production as the make – up artist was not available that day but she looks fab in them. I think this is my favourite picture of Ellie. 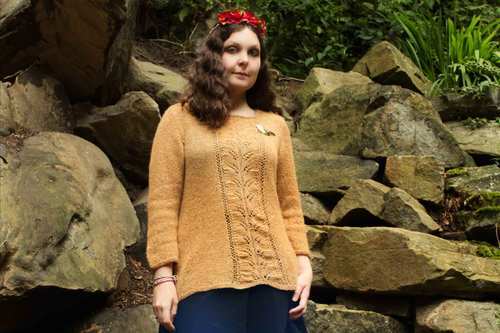 So go and take a look at all the wonderful designs in the full book – it is available on Ravelry and on Sarah’s Alder Sign website, it would make a lovely Christmas present for a knitty friend. I can’t wait until my wrist is better and I can start knitting again. 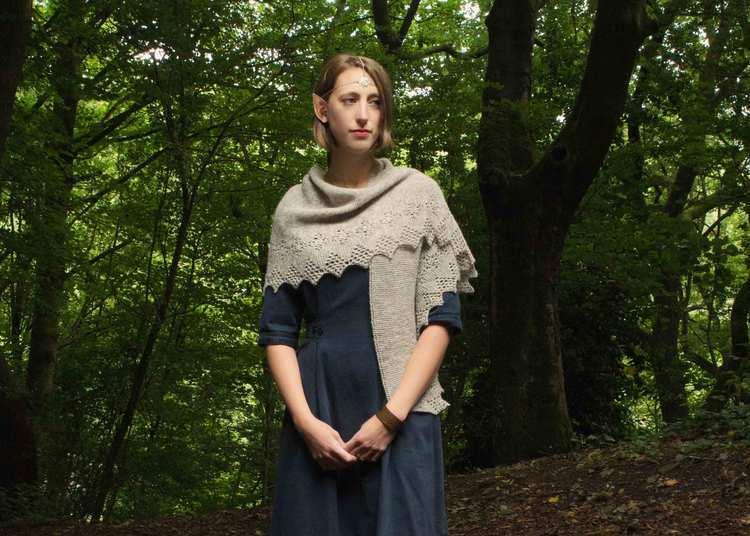 I think I am going to make a shawl like this beautiful one modelled by Suzi, or maybe a jumper for Ellie as she did request one of the ones she had modelled. Copyright for all pictures belongs to Sarah. As long it is not really the end of the world as that would be sad, given the amount of work that Sarah has put into her book 😉 and the fact that Ellie and her best friend from Uni are going to Spain tomorrow for a very hard-earned week of R and R in the sun. Hopefully we still all be here next week, I have a busy week ahead as the trainees are in all week so little crafting time but lots of fun planned around that. Have a good week ahead and thanks for visiting. Hello everyone, hope that you had a nice weekend, mine was very productive, a lovely and not too damp walk with Ted where I picked lots of blackberries for crumbles and lots of sewing on the wedding jacket. 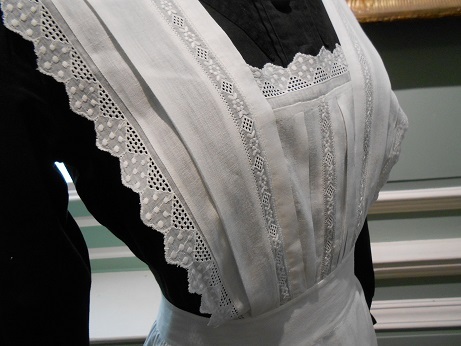 It is very beautiful material to work with, silk brocade, a change from my usual linen. 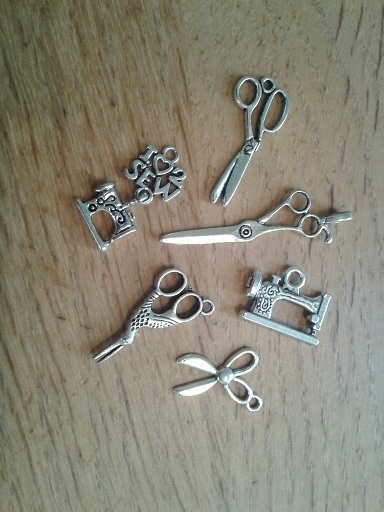 As regular readers will know I love adding charms to my stitched pieces so I thought that I would show you some of the some of the charms I have bought recently and finishes for Sarah’s stall. 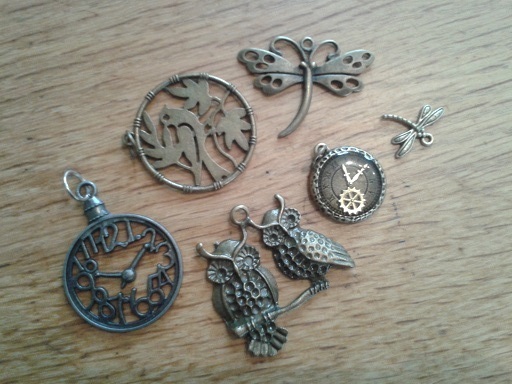 I sent some pictures of my finished, ‘A Stitch in Time’, paper piecing case to Jenny of Elefantz and she really liked the clock charm, there were lots of these at the recent Steampunk event and I bought some more from the market there as well as some dragonflies to add to some of the flower designs she does. 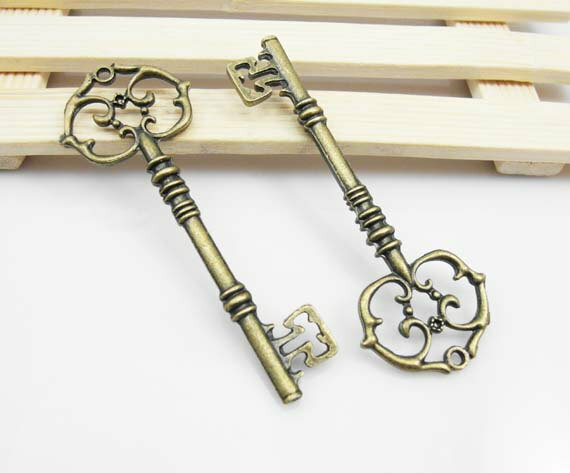 Also got these beautiful keys, when we go and visit National Trust houses they often have displays of keys and these are so lovely. 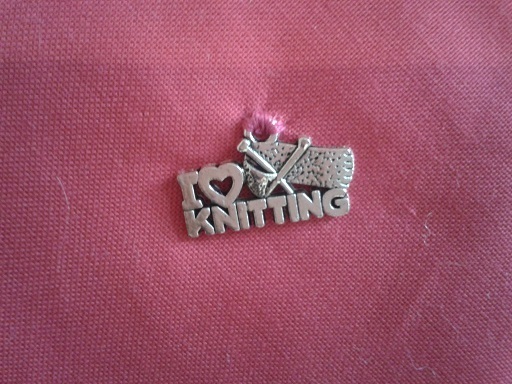 I have bought lots of little charms to go on stitched gifts, I now have ones that say, ‘I love …..’, for knitting sewing and quilting. I got most of the sewing and snowflake ones from this Etsy seller, Bohemian Findings, she has one of the best selections I have seen. Another supplier I have used is DIY Club – also on Etsy. 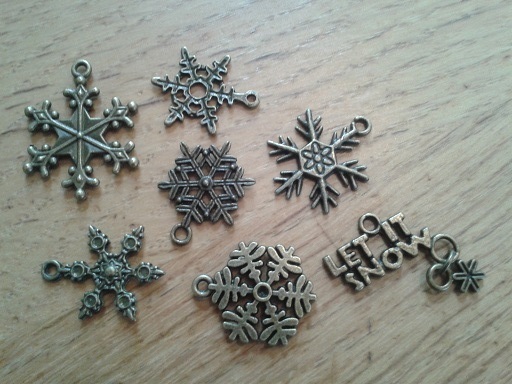 These ones below are for use on the Christmas ornaments, I have two sets so that I can use pairs on the baubles I make. 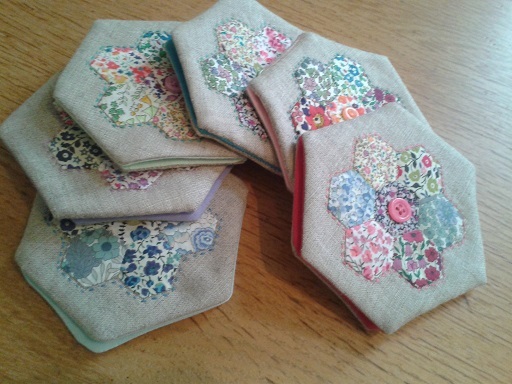 These are the needle/pin books I have made to match the pincushions for Sarah’s Yarndale stall. I found some very cute button headed pins to add to my stock of novelty pins so have added a few and a charm. I got these from Glitz and Pieces on Amazon. I am never sponsored by any of the suppliers I link to, I just do it because I know I like to know where people get things from, I have seen some very cute bird headed pins on a blog recently and need to find them next! The new term starts tomorrow with a new group of teacher trainees, I do like autumn, even though there is a sense of things finishing for me it is all about new possibilities. Take care and have a nice rest of the week, see you all again soon and thanks for visiting. 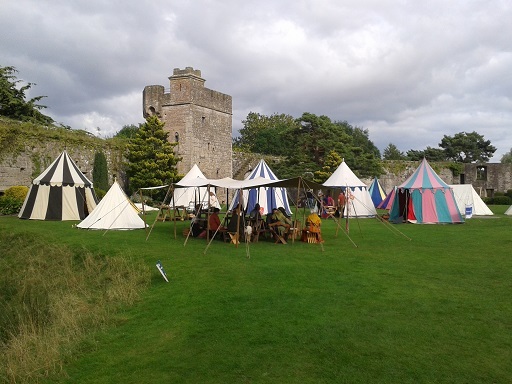 I think my favourite time in re-enactment is the end of the first day of an event, especially when it is sunny and you have had a good day when everything has gone to plan and both re-enactors and the public have enjoyed themselves. Then you can look forward to a relaxing evening, maybe have a BBQ, sit round the camp fire and visit the beer tent later on. All lovely with the added prospect of another event day tomorrow. 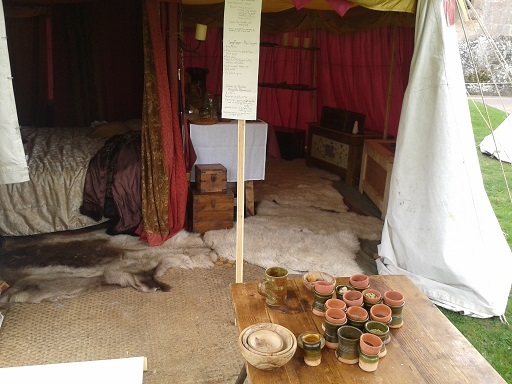 These photos below were taken at the end of Saturday at the Caldicot show last weekend. 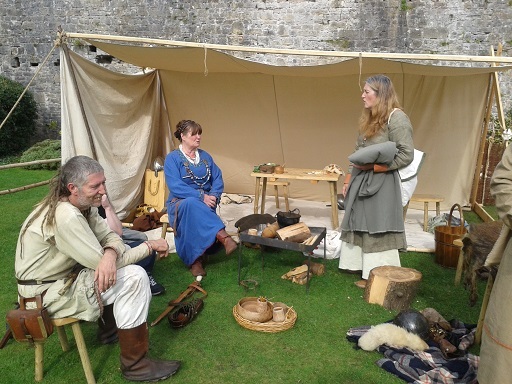 Caldicot was my first ever large re-enactment event and that is where I fell in love with doing this. 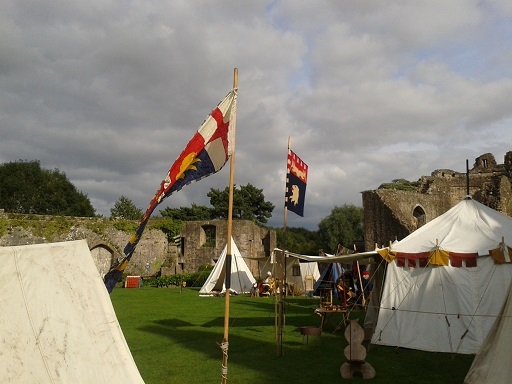 We are so lucky to be able to do this and be in lovely places full of beauty and history. 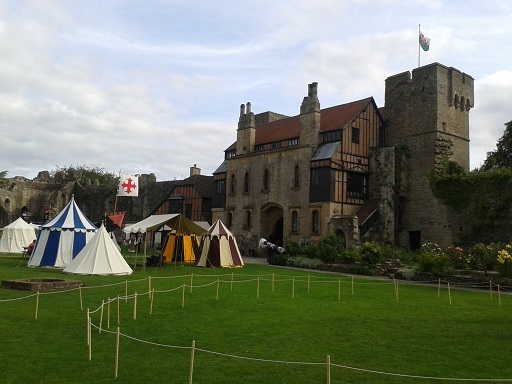 The castle is a magical place, especially when the evening sun is shining on it and I was just wandering round taking pictures of people relaxing outside their tents, or in the case of the Battle of the Nations group doing a bit of sword training. 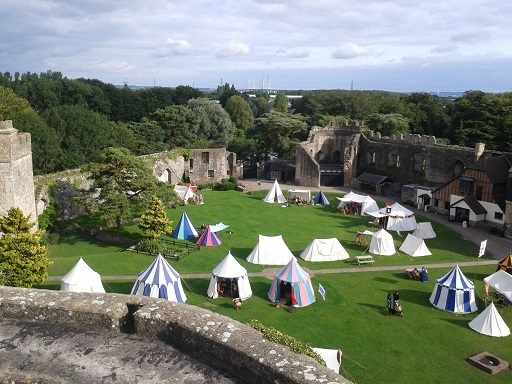 The view from the top of the tower was brilliant, thanks to all of the groups who camped inside the castle with their living history displays, it really does bring the castle to life. I have been helping to organise this event for the last few years and along with Ellie will be organising it again next year, this was our last show for this year and a great way to end the season. 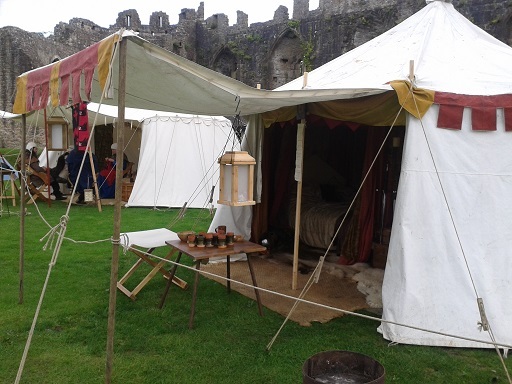 It has been a very variable year in terms of weather, Caldicot being the only show where we have not come home with a wet tent, but still brilliant fun. 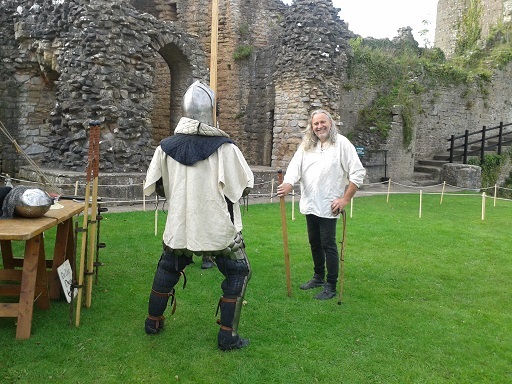 Our group, Swords of Mercia, have done more shows for English Heritage than previous years and got good feedback from all of them and hopefully we will get the chance to do those shows again next year. 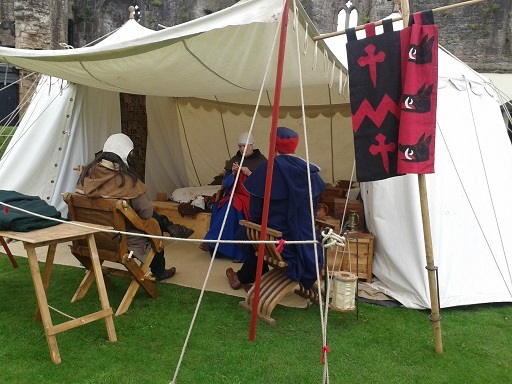 We have had lots of sitting round campfires, discussing armour and kit, all the new things the boys have bought or want to, and all the things we have made or are going to make. As usual we have promised to be more organised for next season and make sure that all kit is made well in advance. We shall see if that actually happens! 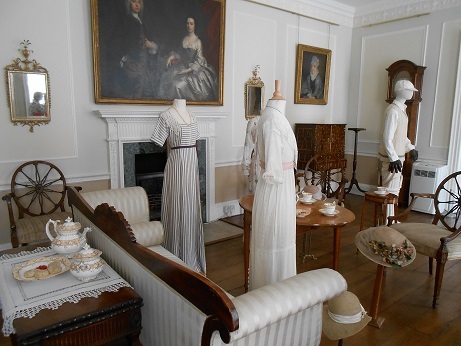 Hope that you have a lovely weekend planned and thanks for visiting. 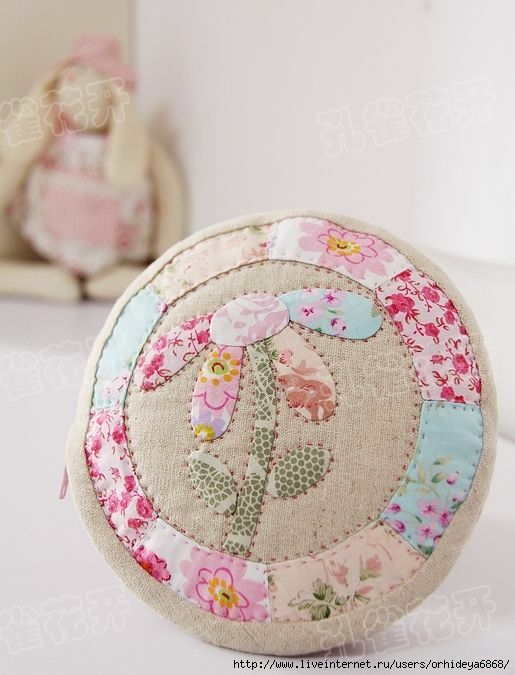 You may know how much I like pincushions, I love making them, (here is a link to a post with some that I have made), I love using them and love looking for inspiration for them on Pinterest. 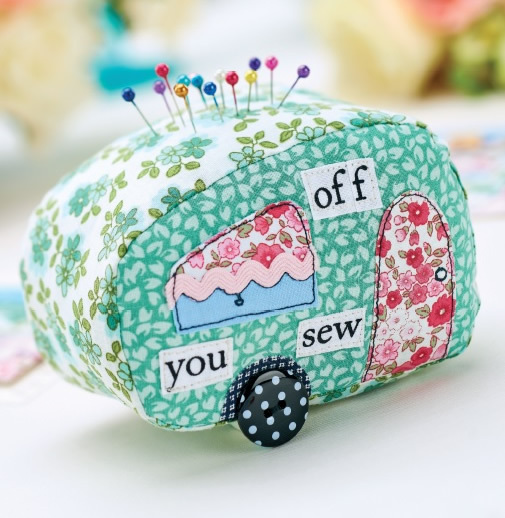 Well one of my favourite bloggers – Amanda Jean from Crazy Mom Quilts has just released her first line of fabric called Good Neighbours and to celebrate she is having a pincushion party! What a brilliant idea – I have been visiting the first few on the party circuit and they are all very lovely. Here is the list from Amanda’s blog if you would like to go and have a look, lots of lovely ideas and they make fab Christmas presents for stitching and knitting friends. Here are a couple on my wish list to make – look at this pretty daisy one with a tutorial here – this is a Russian site but the pictures explain it well. This one just has to be one of the cutest ones on the planet! The tutorial is here. 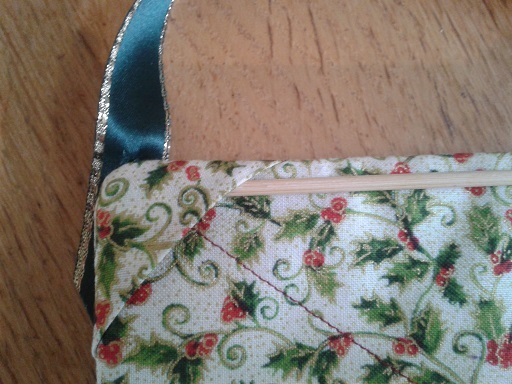 Have just finished one of the knitting needle cases for Sarah’s stall, pleased with the design and with the cute stitching I have used from my lovely new machine! 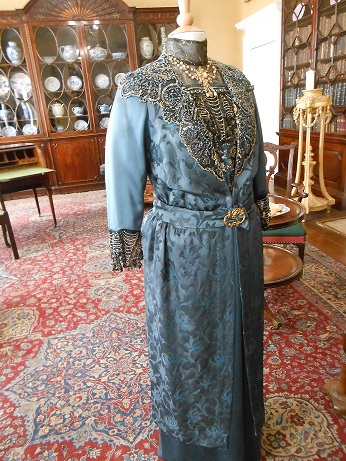 Updates of all of that later, I have so much lovely stuff to blog about, been a very good week! 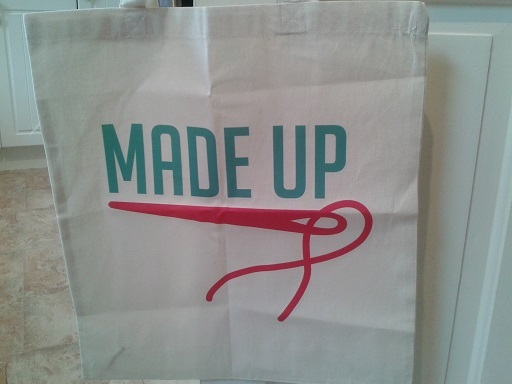 Today is the final day of Karen’s Made Up fund raising challenge, there is still time to donate if you haven’t done through the Just Giving page. 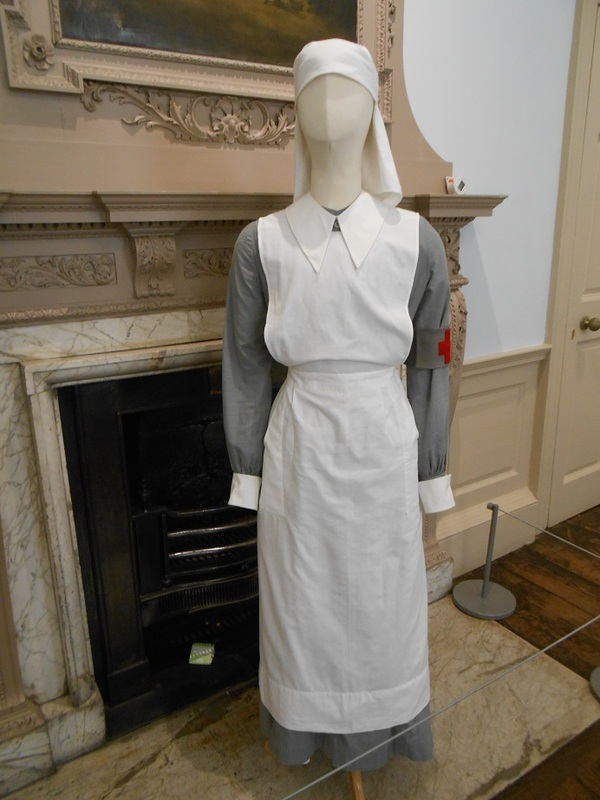 The initiative has raised over £2500 – way more than the initial £1000 hoped for so that is brilliant, well done Karen! 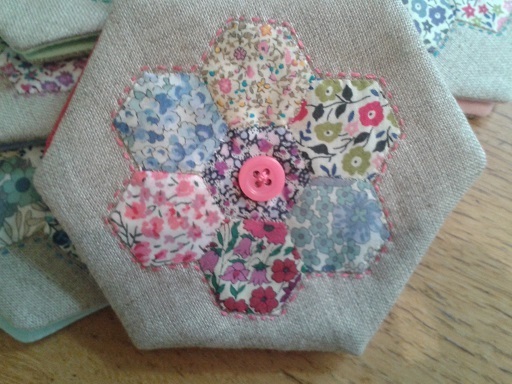 Thank you Karen, it is lovely and I always need lots of sewing bags to carry things to and from groups. 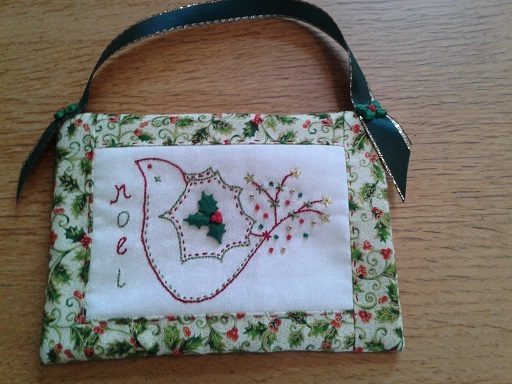 I have finished the ornament that I said I would make, the design is adapted from Jenny of Elefantz August Stitchery Club design, I just used the central bird motif, added beads and star sequins and the word Noel. I put it together with two layers of thin wadding, on the rear just quilted across the ornament and on the front hand quilted. 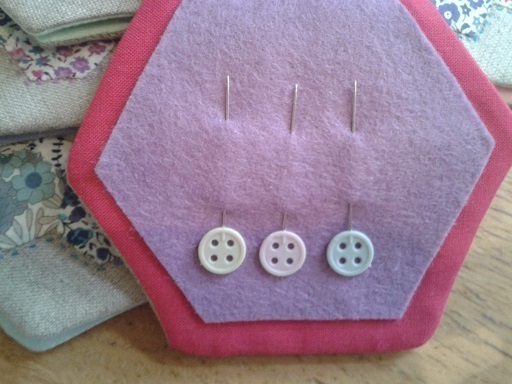 I added some little hanging corners using Jenny’s tutorial and a bamboo skewer to keep it in shape. 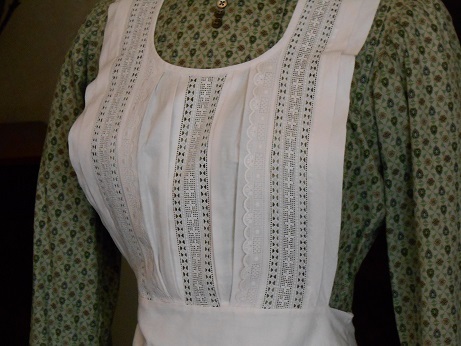 The white fabric I stitched on also has little leaves on it. The holly fabric is some of the new stash from the Festival of Quilts. 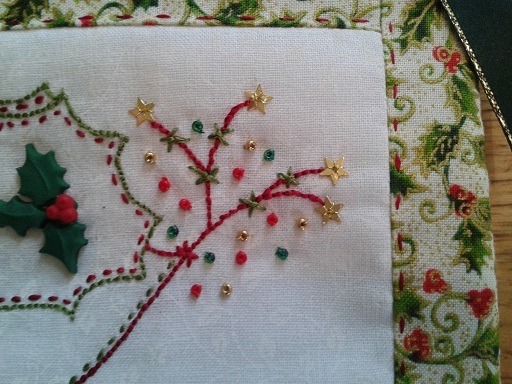 I have lots of different holly fabrics and love them! I do love the little holly buttons, I have been using these for a few years in my ornaments, you can get them from several sources including here on Ebay. I am very pleased to have finished the pledge on time as lots of other finishes going on here, (and starts as I cut out the wedding jacket today eek! 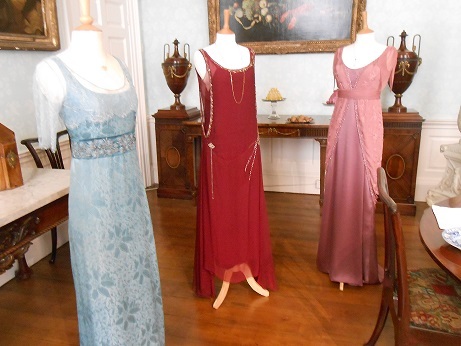 ), am having a busy time finishing the things for Sarah for Yarndale as well. Am also having serious technical difficulties as my mouse has stopped working, (I struggle with just the pad on the laptop), and I still can’t find my camera, which would not be so much of an issue if all the pictures on my phone did not keep turning themselves upside down!! Am looking forward to getting everything done and then I am going to do lots and lots of other embroidery designs from my Jenny folder! 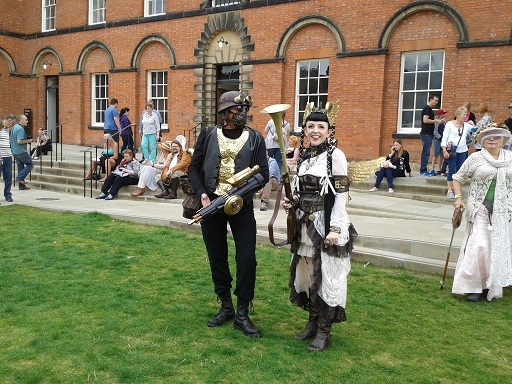 What we didn’t realise when we got to Lincoln for our event was that the city was also hosting Europe’s biggest Steampunk Festival so we had great fun looking at all the wonderful costumes. 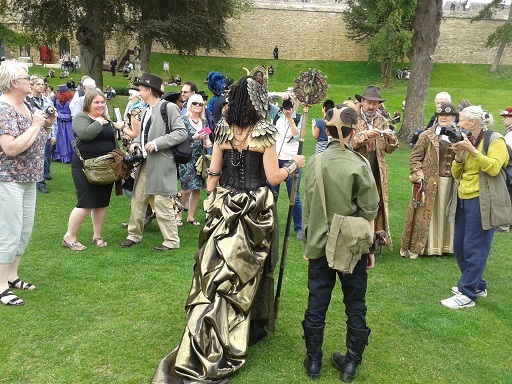 We had planned to visit Lincoln Castle anyway before setting up our event and it was full of people in costume, events such as a fashion show and a market. 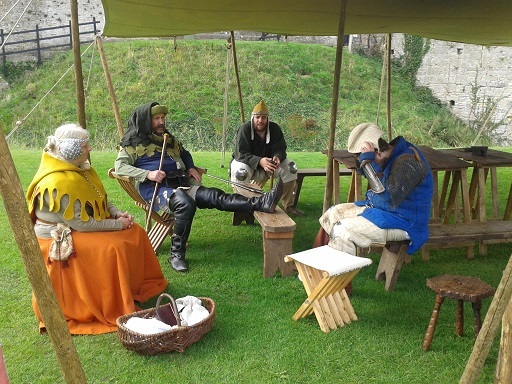 There were some fantastic costumes and weapons, managed to get a few pictures on Saturday before we got into kit. Could only get a back shot of this Cleopatra inspired one – what a gorgeous costume. I loved this lady’s wings. Some explorers and butterfly collectors. 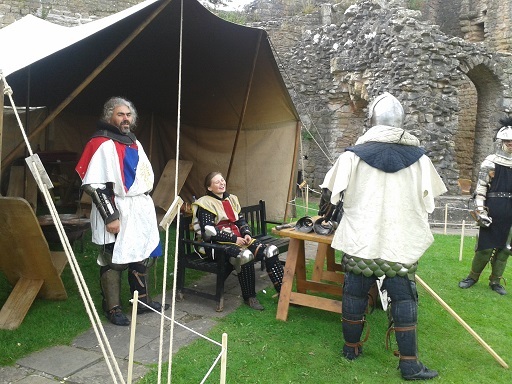 Over the weekend we also went out in kit to help promote our event and we had lots of people stopping to take pictures of us. 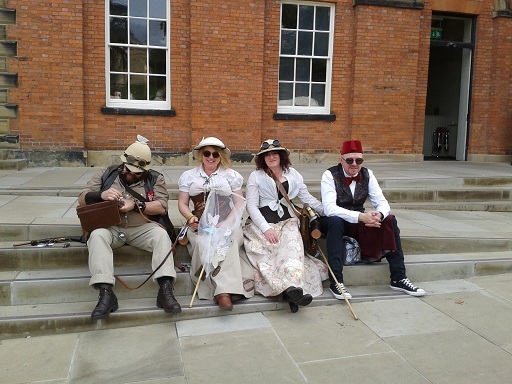 Had to explain to them that we hadn’t got the time period wrong and I wasn’t supposed to be a Steampunk nun! 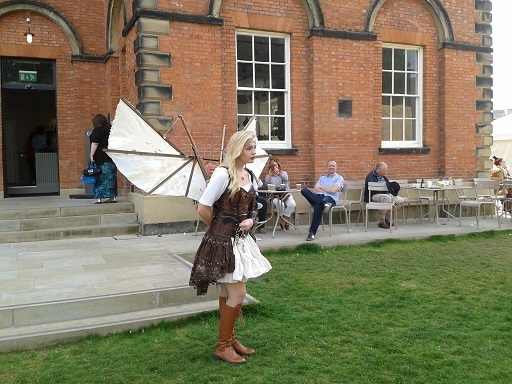 Really enjoyed it and as Ellie has always wanted to do Steampunk we girls have decided that we will go to event next year dressed up, just for the Friday and Saturday and then do a quick change into medieval mode for our event on the Sunday and the Monday. 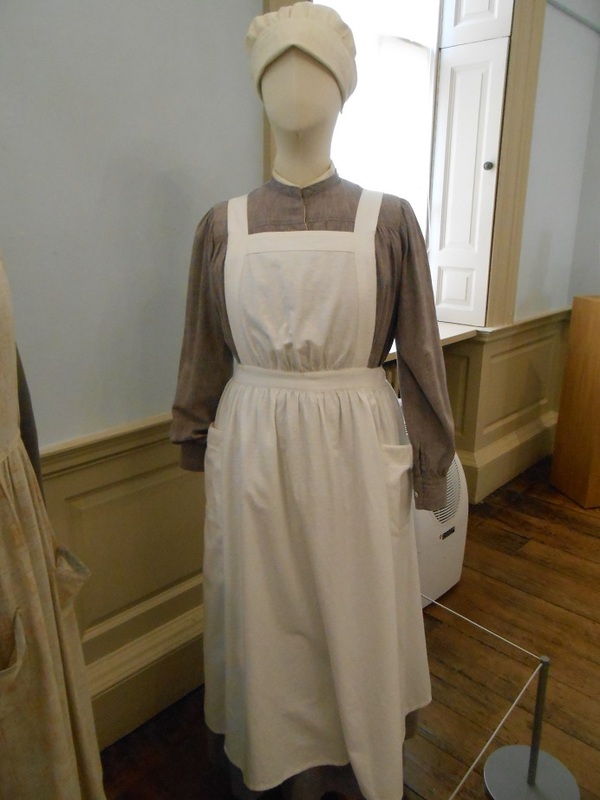 Sounds like a great plan, I do love dressing up and am looking forward to making a costume. 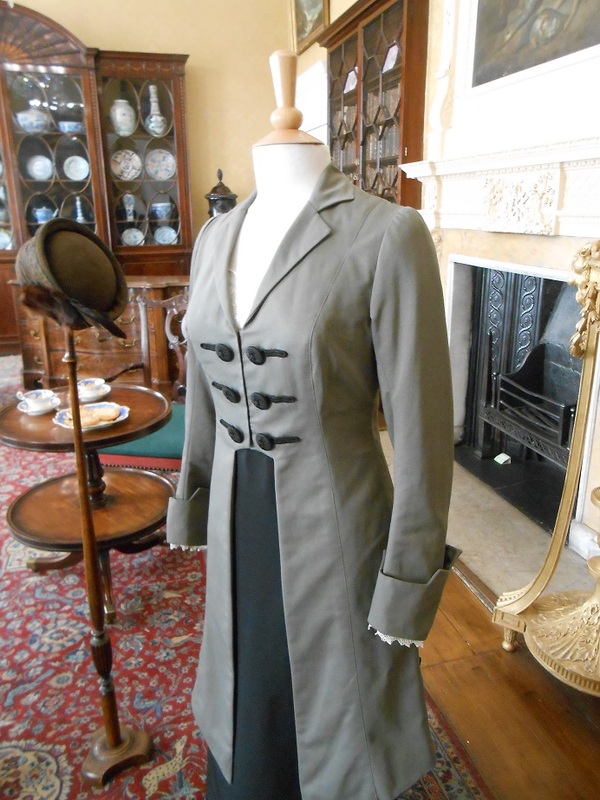 Luckily my lovely son Jake has a top hat he doesn’t use any more ,bought for his prom, and the pattern I am using for the wedding jacket is a Steampunk one anyway so I am half way there! Have a look at this Steampunk Pinterest page for inspiration. 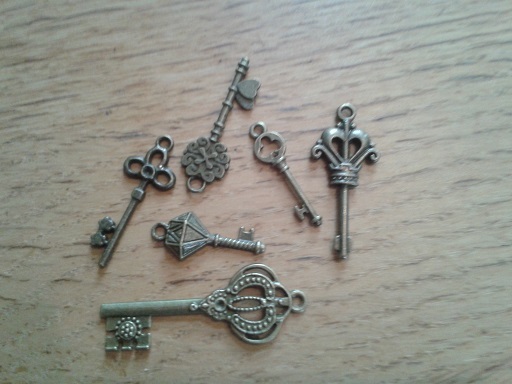 It means that I can also indulge myself in some more charms like these gorgeous keys and clocks. 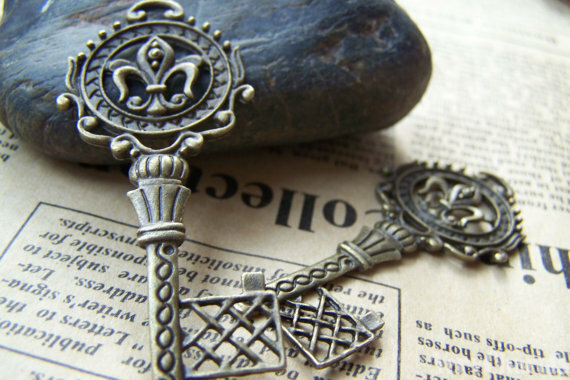 I have these beauties on my Etsy wish list at the moment. 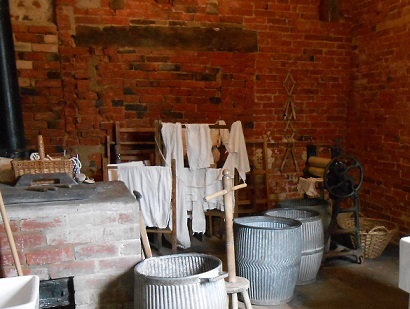 Right back to the day job then, see you all later and thanks for visiting.